The sketches of graffiti show the painter as being obstructed and hindered in the drawing. The Phyle's are placed following and beside a cartouche. 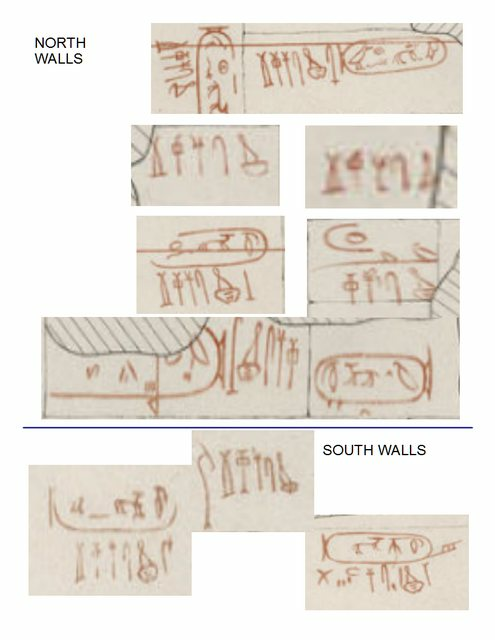 These images from Perring and Hill show the drawings were done in Situ. Egyptology side says painted on at the quarry. Maybe Egyptology will commit to painted in Situ soon. ..damage control. I am not an expert in calligraphy /or hand style writing by ink or paint. My eyesight detects mistake patterns in drawing which repeat in these chambers. Sitchin is also correct...they are overtly large . The chamber compartments change in area...some places leave little room to move comfortably. By focusing on the stones next to the Cartouche/Phyle graffiti. ..the impression is visually obvious. This was done in Situ. ...and it's sloppy rendering. Egyptology says it's consistent with then Dynasty Era. The 3 Pyramids at Giza are silent for Royal cartouche and Graffiti. Then it's a East LA spray paint graffiti riot! Khufu Family line and Khufu Elites were burried there. Vyse hesitates to commit to which Kh symbol he will use...IE. ..open disc or hatched. Before drawing Khufu in Campbell's which is sent by boat to England. Hesitation in physical red ochre drawings. .
Hesitation in Royal designate Cartouche. Even if Egyptology suddenly says the Graffiti was drawn in Situ. Are we to believe the shoddy drawings which are overtly large and crooked. .
We're drawn like this before the ceiling blocks were laid over the chamber? ..